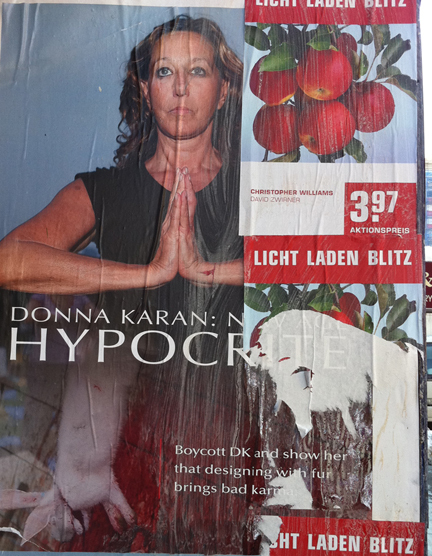 "Donna Karan: New Age Hypocrite"
Daisy Jane Danger and I stumbled upon this little “Donna Karan: Bunny Butcher”-esque call to action while walking through Chelsea. It’s not every day you get to see the New Age movement being publicly called out on their pooh-pooh. And yet, I’m not sure it’s fair to call Donna Karan, who in 2009 donated $850,000 to Beth Israel Medical Center in support of offering yoga to cancer patients, let alone yoga in general (which is what is implied here), “New Age,” an accusation that panders a little too close to the any-interest-in-Eastern-philosophy-is-New-Age crowd for my liking. That said, there’s obviously a number of uncomfortable marriages of faith going on when a person promotes a yogic discipline while at the same time benefiting financially off the Chinese fashion fur trade, which has been documented as being extremely cruel for some time now. NOTE: PETA has something to do with the posters, though I have not found anything claiming that they are behind the actual wheat pasting of them along NYC streets.